One of the world's best cities, London seems to have something for virtually every traveler. An icon of the western world, it has quite a long history and it seems you can feel it walking among the storied sights of what is now a modern metropolis. While we ended our Orient Express train trip with London, our time there was unfortunately very short. However, I've also had a chance to visit London on a weekend trip. Our many travels have taken us through Heathrow on numerous occasions as well. The myriad options for airport transit also make it very easy to see London even if you only have a few hours on a layover. The Underground makes moving around the city incredibly easy and safe. I decided to take a bike tour when I visited London. Bike tours can be great fun, and are often a really useful way to get an overview of a city upon arrival. After forming a big picture, it can be easier to choose which sights are worth more of your time. On the Fat Tire Bike Tour of London, I spent a few hours seeing the sights and getting lots of information from a knowledgable and friendly guide. An actor by trade, he made it really fun. Princess Diana is still memorialized. I thought Harrod's was worth a stop. The food court is large and tempting. Of course I had some tea. I decided on The Orangery, and they were good to a solo diner. The Tate Modern was a museum I had to visit, but unfortunately they don't allow photos inside. There is plenty to photograph on the streets, however. 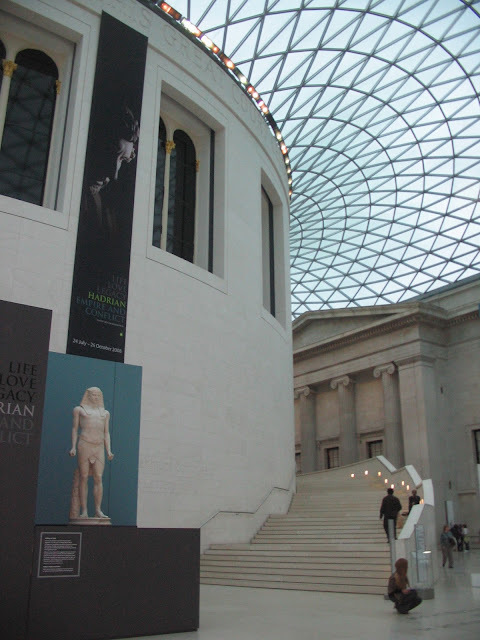 On a rainy day, a visit to the British Museum was in order, and they do allow photos in their expansive collection. Imperialism and conquest have filled the coffers to the brim. It's huge and can be almost overwhelming, but is a great museum. I skip Madame Tussaud's but I suppose that means there's still things left for me to do in London..